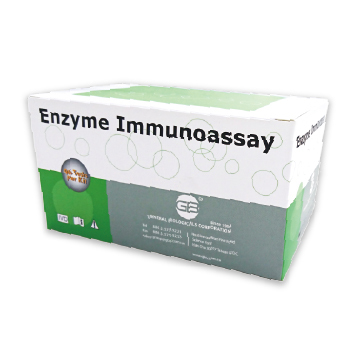 The Chlamydia trachomatis IgM ELISA is intended for the detection of IgM antibodies against Chlamydia trachomatis in human serum or plasma. For the quantitative determination of the thyroid stimulating hormone (TSH) concentration in human serum. At TSH concentrations of 0.1 μIU/mL and 0.2 μIU/mL, the interassay CVs were determined to be 11.4% and 7.9%, respectively. For the quantitative determination of the Triiodothyronine (T3) concentration in human serum. The sensitivity of the GBC’s Total T3 EIA test is defined as the lowest concentration of T3 that can be distinguished from 0 ng/mL as calculated from the 95% confidence limits of the 0 ng/mL standard absorbance. This method will reliably detect T3 concentrations as low as 0.2 ng/ml. For the in vitro quantitative determination of Free Triiodothyronine (fT3) concentration in human serum./Minimum Sensitivity: 0.05 pg/ml. For the quantitative determination of the Total Thyroxine (T4) concentration in human serum. The minimum detectable concentration of T4 that can be defined by this assay is 0.5 μg/dL. An Enzyme Immunoassay Kit for the Quantitative Measurement of Alpha-Fetoprotein (AFP) in Human Specimen as an aid in the Prognosis and Management of Cancer or Certain Fetal Disorders. For the quantitative determination of the Cancer Antigen CA125 concentration in human serum. The minimal detectable concentration of CA 15-3 by this assay is estimated to be 5 U/mL. The minimal detectable concentration of CA 19-9 by this assay is estimated to be 5 U/mL.